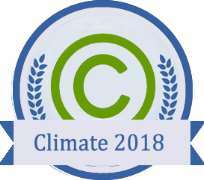 The Conference series LLC Ltd the international agency and official organizer of the Annual World Climate Change and Global Warming Conference which held from 23rd - 24th May 2018 at the magnificent Hilton Hotel JFK Airport in New York, USA, bestowed an Environmental Certificate of Achievement Award Plaque to a young emerging global advocate on climate change from Nigeria at it’s 5th edition of their 2-day international conference. Dr. Thomas Wysmuller the renowned NASA meteorologist and Prof Karina Paredes Paliz an international expert on phytoremediation from Ecuador. The event brought scholars from Europe, Asia , and another part of South America, captains of industries and participating delegates from the different nationalities. Conference series LLC Ltd said it selected Mr. Gbujie Daniel as the first African speaker at the opening ceremony of the conference, following the submission of a wonderful research paper he wrote titled; " Is Climate Change the Armageddon that was foretold? : A review. "highlighting the cataclysmic end of world senario of climate change and honored him also because of the climate advocacy actions that he coordinates across the globe especially among vulnerable nations. Dr. Hector M Guevara, the Founder of NuEnergy Technologies Corp, USA reiterated the organizer position by saying that Achievement Award was in recognition of the impeccable and phenomenal oral presentation, which was said to be one of the best presentation of the entire conference. Dr. Guevara said " I was shocked at the level of insight and understanding of the climate issues that that the young African Gbujie has, with the wonderful work of his organization does on climate change advocacy, it's an honor deserving for man like him, so I happily present the certificate of Achievement Award to him", he said. Speaking to few African reporters after the conference, shortly after the news of his exceptional performance was received. He said he would give a brief speech because he had an online conference meeting with his organization Team 54 Project members in Algeria.
" Very quickly I am humbled to be selected as one of the speakers at the 5th edition of this yearly conference following the submission of my paper, though aware that thousands of applications were received but I was honored when the selection committee reached out to me early this year to say I will be a speaker at this global event," he said.
" Being a recipient of this prestigious certificate of Achievement Award and hearing all the accolades from delegates and other speakers was indeed a fulfillment of my dream to keep forging ahead and never to accept the opinions of others as my reality, I was even more ecstatic when the great international scientist Prof. Easterbrook reaches out to me after my presentation, he give me his number and other contacts and told me to keep up the great work, it was nice.” He said. Gbujie claims that he is not too sure if he is deserving of the global recognition in this stage of his young life, since he believes that his dedication and work to creating sustainable future for millions was still a work in progress. Gbujie says he will remain dedicated for life towards the advocacy of global actions against climate change and would continue to support the Sustainable Development Goals of the United Nations, created to see that mankind move towards the path to a green sustainable future. He is the founder & Chief Executive Officer of TEAM 54 PROJECT, a global group that raises awareness about the impact of Climate Change across the globe and coordinate, educate and empower advocates across 169 nations to take furgent Climate actions (SDG 13). He is an Medical personel (oral surgeon) , an environmental activist, and an international multiple environmental Award Winner. Gbujie was appointed a global Ambassador for MAPS in 2018; The Marine Arctic Peace Sanctuary (MAPS) is an initiative of an international organization called PARVATI.org, which advocates that all of the Arctic Circle and its biodiverse species be declared as a marine protected area devoid of any form of exploitation, and commercialization. MAPS also advocate for a global shift away from the fossil driven economy to a clean sustainable energy. They are trying to get this treaty signed by reaching out to world leaders and global citizens to a commit to the treaty. Gbujie made history as the first African doctor to be part of a delegation that represented the World Medical Association at the United Nations Conferences on Climate Change called the COP 22 and has been recently invited by the President of the United Nations (UN) General Assembly H.E Miroslav Lajčák, to be part of Youth Dialogue Conference starting from the 29th-30th May 2018. Over 400 youth were selected through a rigorous process by the UN because they all have impacted positively on the world. They will be deliberating on how youths can be empowered to address the global challenges that plague the world in the High-Level Meeting at the UN headquarters in New York. Gbujie is indeed a shining example for youth all over the world to emulate and he remains a true treasure and indeed a gift to the African continent. Author: is freelance Environmental journalist now based in Kenya,he attended the conference.